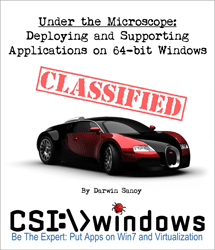 Alumni of CSI-Windows.com and DesktopEngineer.com training courses are given access to the CSI-Community resources listed below. If you have taken training with us in the past and wish to access CSI-Community, please use our contact form to request a reactivation of your alumni profile. The 007 Guarantee allows you to schedule one-on-one, online lab time where you receive expert assistance on real problems with an Application OR Windows Installer package running under Windows 7 in your production environment. More details. Receive 10% of the price of training you take as a loyalty rewards credit. Use your CSI Cash for your own training or gift it to a colleague. If you have taken our training in the past you can receive $250 CSI Cash for reactivating your Alumni Community account (request reactivation here). Alumni can receive additional track completion certificates by completing the courses they have not previously taken in a given track. For instance, even though CSI-300 is a part of many tracks, alumni never need to repeat the class to complete multiple tracks. Alumni receive $50 CSI Cash each time they refer a new customer to our training. Please make sure the colleague fills in your name and email in the referral fields during their registration. Webinars are held on special learning topics and products periodically throughout the year. Download special tools, document resources and hands on labs. News about new additions and changes to all the above resources. Have the community news mailed to you. Your alumni profile tracks the courses and achievements you have completed through training with CSI-Windows.com and DesktopEngineer.com.